First download the Chrome extension Here. Restart Chrome to finalize the installation. Upon restarting, you will see the follow icon at the top right of your browser window. This is how you know Click to Call is installed. 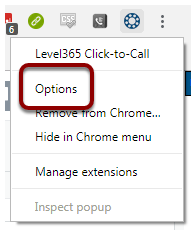 Now right click on the Click to Call icon and select Options. Enter your Portal credentials. The same credentials you use to log into the Portal are used for the Click to Call plug-in. If you are unsure of your credentials, please see the Forgot Login Name or Forgot Password articles. Now that the Click- to-Call plug in is installed and you have entered your login credentials, you are ready to use Click to Call! 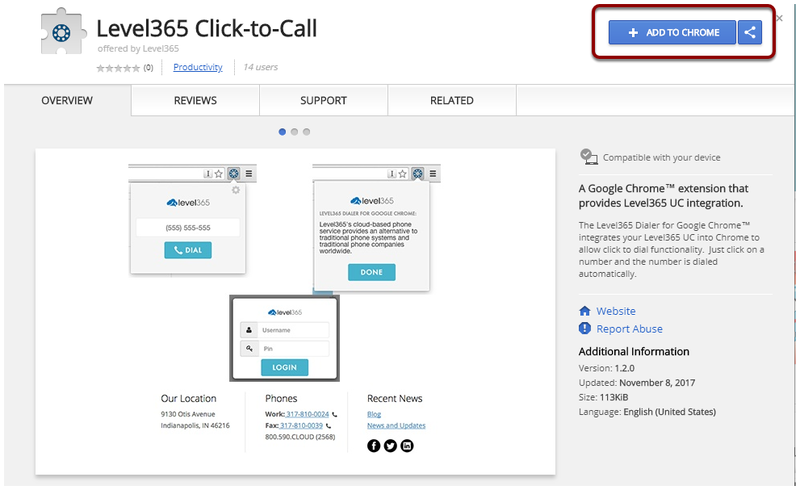 Whenever you mouse over a phone number from within Chrome you will see a blue pop up Call button. When you click Call, the system will call your desk phone, Dialtone cell phone App or WebClient phone, depending on how your Answering Rules are configured. You will here the operator say, "Your call is now being forwarded" And you will now be connected.